Some of the most watched American television programs regularly involve viewers in religious and spiritual topics. What exactly are America's most popular shows asking us to think about? In a recent poll, millennials ranked the following shows as their favorites: The Big Bang Theory, NCIS, The Walking Dead, American Horror Story and Game of Thrones. On the surface, none of these shows would seem to focus a lot on religion. Taking a closer look, however, we see spiritual or religious messages showing up in their settings and plots, and, often, as hot topics in online fan forums. Here, I'd like to comment on two types of religion-related commentaries I have noted being offered up in these shows: 1) reflections on the benefits of a pluralistic society, in which different religious paths not only coexist but are each seen as valid; and 2) calls for reevaluation of spiritual and religious commitments as humanist commitments. Could the fact that these TV shows tacitly assert a kind of universal ethics, one that can be applied by people from many religious traditions or secular perspectives, account in part for their popularity? In this series of blog posts, I will look at some ways in which the supernatural, ritualistic, mythological and theodicean themes showcased in the above shows ultimately act as conversations about religion's role in our lives today, and about what happens when faith differences are ignored or elided. 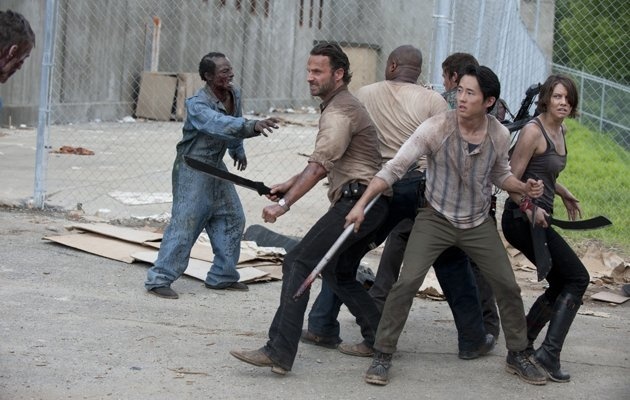 Hugely popular among millennials and Gen-Xers (and recognized as 2015's "most tweeted about show"), The Walking Dead is premised on the religious theme of apocalypse. For those who don't watch--and I admit I required cajoling myself--here is a quick overview of its over-the-top-distasteful, utterly unbelievable yet strangely compelling dystopian set-up. 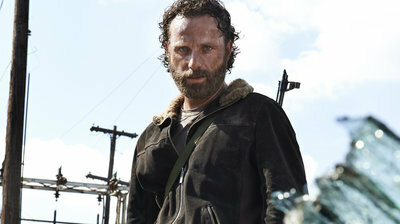 For six seasons now, a set of enigmatically ordinary human characters has struggled for survival against an ever-growing population of zombies. While they fend for their existence, they must also face the implicit question of whether there is actually any good reason to do so. With a ratio of about 5,000 zombies to every human (according to fans' calculations), it's far from clear that there will ever again be any semblance of a society worth living in. The protagonists, a randomly thrown-together group of individuals trying to find safety amid swarms of these undead or "walkers," forge tenuous bonds based largely on a kind of desperate faith in one another's humanity. When the beleaguered group gets an occasional respite from the almost constant onslaught, they are often portrayed fighting personal battles as they struggle with notions of faith and salvation, the point and purpose to their lives. This set-up inherently raises the looming issue of how a caring god can allow such extreme suffering and evil (the central Judeo-Christian theodicy). It's complicated. The fact is that their undead enemies are not actually acting out of malice, per se. Walkers are not so much evil as purely soulless, unconscious, and indiscriminately voracious. It turns out that they, too, are simply trying to survive. To make matters as bleak as possible, these undead include the protagonists' own stricken family members, friends and neighbors--still somewhat recognizable, though completely emptied of their humanity. Over time, we come to realize that no one is above this fate; all humans, regardless of age, health or circumstance, now biologically contain the capacity to become zombies. These plot elements effectively magnify the characters' internal struggles with morality and meaning--On the one hand, there's an easily identified enemy (anyone lurching around growling at the scent of flesh), and on the other hand, it's a "there but for the grace of God go I" situation, as everyone knows in the back of their minds that no amount of good behavior or moral compass protects a person from ending up as the enemy him/herself. The biblical concept of resurrection--the conquering of death, is another religious allegory played to powerful effect in TWD, as Kelly Murphy has written. But it is reconfigured radically. I'll illustrate with examples from the show's early seasons. In Season 1, the character of Andrea witnesses her sister, Amy, bleed to death after a zombie attack on the group. While cradling Amy's head, Andrea watches as the dead girl begins to reanimate as a zombie. Finally she must put her sister down with a bullet to the head. (Destroying the brain is the only known way to finish off a zombie for sure.) Whereas in a Christian soteriology, hope resides in the idea of salvation and an afterlife, in The Walking Dead, moments of hope are found in here-and-now, decisive and impassive actions--that is, in the moment a walker is gruesomely and definitively killed and will thus not rise again. In Season 2, this lesson is brought home when the core group learns that Herschel Greene's clan has been keeping undead family members in their barn, preserving hope that a cure might one day be found. Herschel, a religious traditionalist, eventually sees the grievous error in his thinking. Rather than believing in their "resurrection," he now sees that these zombies will never regain their humanity; his loved ones are no longer. His hope is portrayed as dangerously naïve, as it has compromised the safety of the living. The dead must be made to stay dead. What's more, enforcement by the living of this rule is ultimately egalitarian. Since every person carries the genetic potential to become undead, the stark, materially inescapable truth is that, no matter the quality of a life any individual has lead--the pious, the selfless, the respected leader--none can be allowed to reanimate. They must in the end be dispatched quickly, like a rabid animal (albeit, in some cases, a much beloved one). This realization, the show implies, shakes Herschel's belief in the power of faith alone to bring about salvation. His ensuing period of deep depression, along with a dark, solitary, drinking binge, mirror the kind of gestation which the dead undergo before they "turn." But when Herschel emerges, his epiphany is portrayed almost as a "conversion," if not to atheism, at least away from dogmatic religious separatism. Previously, his Christian ethics had extended only to helping outsiders when they were in danger of dying. He was loathe to let his farm become more than a temporary safe haven to these needy interlopers, whom he had previously regarded as a corrupting influence on his family. Now, he freely opens up his home (read: his mind) to the group, his grown-out hair and newly unkempt beard signaling yet another move away from tidy values. Abandoning his pacifism, he starts killing off walkers with the rest. The message here seems to be that intractable, traditional values must be eschewed; absolute faith in a transcendent and disembodied god is no longer tenable. Or at any rate, it's a shared faith in his fellow humans, scraping by on the ground, that stands a better chance of ensuring survival. Overall, the ethos presented in TWD as most sustainable is a pluralistic, spirituality-tolerant but also secular-friendly one. A later scene in Season 3, in which Herschel reads from the Psalms in the New Testament for strength before a battle does show that religion can still be a source of meaning. One can't help but feel that it is now regarded as ancillary, rather than central, however. In terms of this-worldly codes of action, by Season 3, Herschel has fallen into step with the others, adopting their more rationalist problem-solving mode, and modern, militaristic ethos of organized teamwork and constant innovation. The creators of TWD have ultimately presented us with a kind of thought experiment: If you knew that all your monumental effort just to sustain life might, in the end, still not be enough, could you, like our protagonists, still get busy doing what is needed to care, and to carry on? The characters' struggles with meaninglessness--the kind bred into our postmodern age (and indeed perhaps symbolized here by a zombie apocalypse)--reflect our own. The innovation is that the creators don't stop there. The viewer is ultimately presented with what may be called a more metamodern outlook of embracing the paradox of what it means to survive against such fundamental futilities. That is, with the endless seas of flesh-eating corpses comes a stark undercurrent of understanding about the human condition--that the choice to keep aggressively fighting them off, only to watch more undead rise in their place, is both a Sisyphean kind of ridiculous, and, at the same time, a way of actively choosing life and meaning. Are their efforts naïve? Probably. In the show's reframing of salvation narratives, it turns out that a pretty big dose of a naïve faith in humanity is required, and, the viewer is led to hope, just may save the day.